Brown caught three of seven targets for 28 yards in Sunday's 36-21 loss to Carolina. Analysis: Brown was second on the team in targets for the game but was held to just 28 yards for the second time in the last three weeks. While the 28-year-old has established himself as the Ravens' No. 1 receiver with four games of at least 86 yards on the year, only one came in the last four contests. He'll look forward to a Week 9 home rematch with Pittsburgh, whom he torched for 116 yards and a touchdown in Week 4. Brown caught all seven of his targets for 134 yards and a touchdown during Sunday's 24-23 loss to New Orleans. 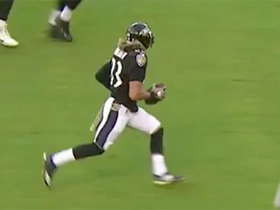 Brown hauled in two of his three targets for 28 yards in the Ravens' 21-0 win over the Titans on Sunday. Brown hauled in just four of 14 targets for 58 yards in Sunday's 12-9 overtime loss to Cleveland. 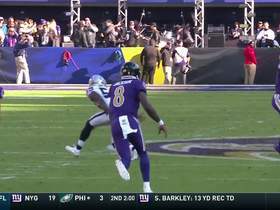 Analysis: Brown struggled to get on the same page as quarterback Joe Flacco in this one, but he was still Flacco's target of choice on 14 of 56 throws. 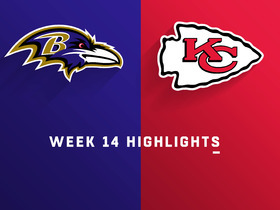 Between his big-play ability and large target share in Baltimore's offense, Brown should stay in the mainstream fantasy conversation all season long, including the upcoming Week 6 clash with Tennessee. Brown caught three of seven targets for 116 yards and one touchdown during Sunday's 26-14 victory over the Steelers. He also rushed one time for three yards. Brown (not injury-related) was a full participant in Thursday's practice. Analysis: After sitting out of Wednesday's practice for a non-injury-related issue, Brown was back in action as a full participant Thursday. Brown is second on the team in target share at 18 percent but has the team lead in receiving yards at 222 -- 67 more than Michael Crabtree. He'll face a Steelers secondary that allows the second-most points to opposing receivers (34.8) in Week 4. Brown didn't practice Wednesday, Jamison Hensley of ESPN.com reports. Analysis: Per Hensley, Brown was spotted on the field Wednesday without a helmet or pads while working with the Ravens' special-teams units, but he didn't return once individual drills commenced. A reason behind Brown's absence will be provided once the Ravens release Wednesday's injury report. Brown grabbed five of nine targets for 86 yards during Sunday's 27-14 win over Denver. 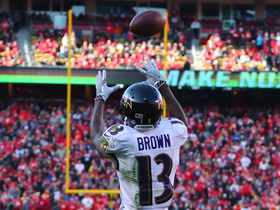 Brown secured four of 10 targets for 92 yards and a touchdown in the Ravens' 34-23 loss to the Bengals on Thursday. Brown caught three of four targets for 44 yards and a touchdown during Sunday's 47-3 win over Buffalo. 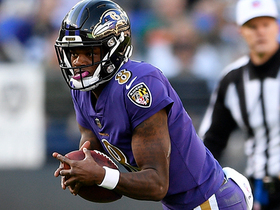 Analysis: Brown drew rave reviews in camp and kept it going late in the first quarter, connecting with Joe Flacco on a seven-yard touchdown in the back of the end zone. Brown had a 1,000-yard season as a sophomore in 2015, so the ability was there not long ago. He fell out of favor in Arizona, but he may have rebooted his career in Baltimore. Brown isn't in uniform for Saturday's preseason contest in Miami, freelance NFL writer Jeff Zrebiec reports. Analysis: With two catches for 24 yards through two exhibitions, Brown isn't exactly lighting up the box score in his new locale, but his presence of mind to get both feet down in the back of the end zone Monday against the Colts was otherworldly. While his injury history needs to be considered at all times, he has a career mark of 14.5 YPC and one 1,000-yard campaign on his resume. Brown scored a seven-yard touchdown on his lone reception on two targets in Monday night's 20-19 win over the Colts in the third preseason game. Brown has been one of the standouts during training camp and has consistently made big plays during practices, Jeff Zrebiec of The Athletic Baltimore reports. Brown isn't in uniform for Thursday's Hall of Fame Game versus the Bears, freelance NFL writer Jeff Zrebiec reports. Analysis: The Ravens completely revamped their receiving corps in the offseason, but the expected top trio of Brown, Michael Crabtree and Willie Snead won't risk their health in the exhibition opener. Expect to experience Brown's explosiveness bit by bit in the preseason, with his most work to come in Week 3. Brown made several impressive catches -- including a 50-yard touchdown -- during Thursday's practice session, Jamison Hensley of ESPN.com reports. "He's had a heck of a camp," said offensive coordinator Marty Mornhinweg after practice. Analysis: The former Arizona Cardinal is quickly making a name for himself in Baltimore. According to Hensley, Brown made a pair of grabs in the red zone and down the sideline that were both more impressive than his long touchdown. 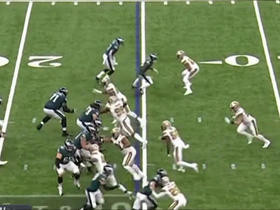 What's more, Brown was working against starting corner Marlon Humphrey on two of those plays. Brown's talent is hardly in question, and if he's able to stay healthy, this could be a resurgent season for the speedy wideout. 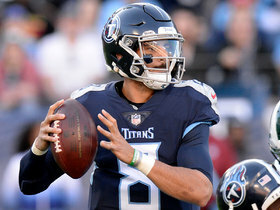 Brown (knee) returned to the field for Thursday's minicamp practice, Jamison Hensley of ESPN.com reports. Analysis: Brown exited Wednesday's session after tweaking his knee, but he's apparently good to go after receiving treatment. 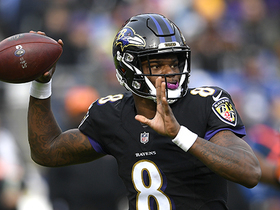 The Ravens may limit Brown's workload Thursday as a precaution, but it doesn't appear that he'll face any restrictions once training camp gets underway later in the summer. Brown suffered a knee injury during Tuesday's minicamp practice, Jamison Hensley of ESPN.com reports. Analysis: Brown never left Tuesday's session but was held out Wednesday. While his ability to finish the first practice suggests the issue isn't too serious, Brown's medical history makes any injury a cause for concern. He's expected to lock down a starting job across from Michael Crabtree, with Willie Snead likely manning the slot in three-wide formations. Thursday's minicamp session will be the Ravens' last practice until training camp starts in late July. The Ravens are slated to sign Brown to a contract, Adam Schefter of ESPN reports. Brown gathered in 21 of 55 passes for 299 yards and three touchdowns in 10 games during the 2017 campaign. Brown (toe) was a full practice participant Friday and doesn't have an injury designation for Sunday's game in Seattle, Bob Condotta of The Seattle Times reports. Analysis: Brown returned from a four-game absence for last week's 23-0 win over the Giants, catching two of four targets for 28 yards and a touchdown while logging 40 of 69 offensive snaps. He'll have one last chance to make an impression before preparing to hit free agency in the offseason. Brown profiles as an above-average No. 2 receiver based on talent and technique, but his stints of good health have been rare since the end of 2015. Brown (toe) was limited in practice Thursday, Darren Urban of the Cardinals' official site reports. Analysis: After ending a four-game DNP streak with active status Sunday against the Giants, Brown needed a bit more time with the rehab group to prepare for a potential appearance Week 17. So far, he was held out Wednesday before Thursday's capped showing, but the increase in work is as good of a sign as any that he's trending in the right direction. Look for Brown's status to receive some clarification by week's end. 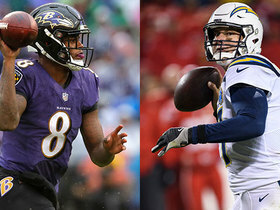 Brown (toe) was a non-participant at Wednesday's practice,Josh Weinfuss of ESPN.com reports. Analysis: It's no surprise Brown is focusing on rehab rather than practice on the heels of his first game action since Week 11. In his return Sunday against the Giants, he logged 40 of 69 offensive snaps, catching two passes (on four targets) for 28 yards and one touchdown. The maintenance of Brown may take up the entire week of prep, but some activity Thursday or Friday would be a positive sign as the Cardinals prepare for Sunday's season finale at Seattle. 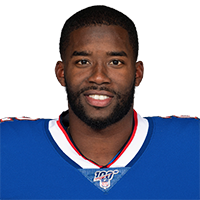 Brown recorded two catches (on four targets) for 28 yards and one touchdown during Sunday's 23-0 win against the Giants. Brown (toe) is listed as active Sunday against the Giants, Darren Urban of the Cardinals' official site reports. Analysis: For the first time since Week 11, Brown wasn't ruled out in advance of a game, indicating a return was possible. With active status confirmed Sunday, his bout with turf toe is officially behind him. Brown will aim to make a splash versus a New York defense that has allowed 14.1 YPC and six touchdowns to wide receivers over the last four contests. Brown (toe) is listed as questionable for Sunday's contest versus the Giants, Kent Somers of The Arizona Republic reports. Analysis: Brown completed his second straight week of limited practice sessions, only this time he wasn't ruled out upon the release of the final injury report. Granted, his status remains up in the air for Week 16, but there's an expectation he puts an end to a four-game absence Sunday, per Kyle Odegard of the team's official site. Perhaps the final hurdle in Brown's intended path is a pregame workout, which could influence whether or not the Cardinals include him on the inactive list. Brown (toe) expects to play Sunday against the Giants, Kyle Odegard of the Cardinals' official site reports. Analysis: Sidelined since Week 11 due to turf toe, Brown has maintained limited practices since Dec. 7 but nonetheless missed his third and fourth games in a row. He would add credence to his prediction of a return with a full session by the end of the week. No matter how he's listed on Friday's injury report, there's at least an inkling he'll be available Sunday for quarterback Drew Stanton, who will be making his first start since Week 10. Brown (toe) was a limited participant at Wednesday's practice, Darren Urban of the Cardinals' official site reports. Analysis: Brown was also a limited participant all last week and ultimately was ruled out Friday for Sunday's game against the Redskins. He may need to log a full session before the Cardinals consider letting him play in a game. Brown would have a favorable matchup if he were to return this week, with Drew Stanton and Co. facing a Giants defense that's given up 8.4 yards per target to wide receivers. Brown (toe) has been ruled out for Sunday's game in Washington, Bob McManaman of The Arizona Republic reports. Analysis: Brown has managed a few limited practice sessions the past two weeks, but his turf toe still hasn't improved to a point that would allow him to play in a game. It's fair to wonder if the impending free agent will make another appearance this season. Brown (toe) was a limited participant in Wednesday's practice, Josh Weinfuss of ESPN.com reports. Brown (toe) has been ruled out for Sunday's contest against the Titans, Darren Urban of the Cardinals' official site reports. Analysis: Brown practiced in a limited fashion Thursday, marking the first indication that he's beginning to put the bout with turf toe behind him. No matter, he hasn't done enough to play and will thus miss his third consecutive game. On Sunday, Larry Fitzgerald will be the focus of the Cardinals' aerial attack, but J.J. Nelson (knee), Jaron Brown (knee) and tight end Ricky Seals-Jones should also be sprinkled in. Brown (toe) was a limited participant in Thursday's practice, Josh Weinfuss of ESPN.com reports. Brown (toe) didn't take part in Wednesday's practice, Darren Urban of the Cardinals' official site reports. Analysis: A case of turf toe has prevented Brown from playing the last two weeks, and he looks to be in danger of missing another game with no reps to begin Week 14 preparations. Behind Larry Fitzgerald, there's plenty of opportunity to contribute in the Cardinals' passing attack, but no one has stepped up consistently of late aside from undrafted rookie tight end Ricky Seals-Jones. As a result, if Brown ever gets healthy, he could make a late-season splash. Brown (foot) has been ruled out for Sunday's game against the Rams, Kyle Odegard of the Cardinals' official site reports. Analysis: Bothered by turf toe the past two weeks, Browns still hasn't returned to practice. His continued absence frees up extra reps for Jaron Brown, JJ Nelson and third-round rookie Chad Williams, though none of the trio is likely to draw more than a handful of targets. With the Cardinals barely in the playoff hunt and Brown preparing to hit free agency, a cautious approach would seem to make sense for both parties over the final few weeks of the season. Brown (toe) didn't take part in practice Wednesday, Darren Urban of the Cardinals' official site reports. Analysis: Turf toe is a notoriously difficult ailment to overcome, and it appears Brown is experiencing just that at the moment. 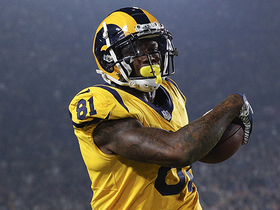 With no practice reps for the second straight week, he's in danger of missing his second game in a row and fourth overall this season Sunday against the Rams. If Brown is inactive again, the receiving corps would be whittled down to Larry Fitzgerald, Jaron Brown, J.J. Nelson, Chad Williams and potentially Brittan Golden (groin), the latter of whom also didn't practice Wednesday. Brown (toe) will not play in Sunday's game against the Jaguars, Darren Urban of the Cardinals' official site reports. Analysis: Cardinals coach Bruce Arians hinted at this outcome earlier in the week when he said Brown might miss some time. Arians also said he wants to give other wideouts some opportunities, specifically mentioning rookie third-round pick Chad Williams. With the Cardinals essentially out of the playoff race and Brown already slumping, it's hard to imagine the team would be in any rush to get him back in the lineup. There's also a chance Brown will have a limited role whenever he returns. Cardinals head coach Bruce Arians said Monday that Brown is dealing with a case of turf toe and could miss some time, Scott Bair of NBC Sports Bay Area reports. Brown (back) is active for Sunday's game at Houston. Analysis: In preparation for this outing, Brown took part in a pair of limited practices Wednesday and Friday, which was enough to get the all-clear from the Cardinals' training staff. He'll look to turn his season around against a Texans defense that has been torched by wideouts to the tune of seven touchdowns and 18.3 YPC over the last three contests. Brown (back) is expected to play Sunday against the Texans, according to ESPN's Adam Schefter. Analysis: Brown was limited in practice Wednesday and Friday this week, and while it sounds like he'll be able to give it a go Sunday, it's worth noting he hasn't caught more than four passes in any game this season while failing to get even three receptions in each of the past three. Brown (back) returned to a limited practice Friday and is listed as questionable for Sunday's game in Houston, Darren Urban of the Cardinals' official site reports. Analysis: Brown sandwiched a pair of limited practices around Thursday's absence. He's probably on track for Sunday's game, but he hasn't caught more than two passes in a contest since Week 6. An absence would free up more snaps for J.J. Nelson in an offense that will be led by Blaine Gabbert this week. Brown (back) was a non-participant at Thursday's practice, Kyle Odegard of the Cardinals' official site reports. Analysis: Brown's downgrade from a limited session Wednesday isn't exactly an encouraging sign for the oft-injured wide receiver. If he's unable to overcome the back issue in time for Sunday's game at Houston, the Cardinals will rely more on Jaron Brown and J.J. Nelson behind top option Larry Fitzgerald. Brown was limited in practice Wednesday by a back injury, Darren Urban of the Cardinals' official site reports. Analysis: Making his first appearance on the injury report since Week 6, Brown nonetheless avoided getting tabbed with a lower-body ailment, which has been the bane of his existence the last two seasons. He'll be afforded two more chances to return to a full practice by week's end, at which point the Cardinals will determine his odds to suit up Sunday in Houston. Brown brought in two of six targets for 27 yards in Thursday's 22-16 loss to the Seahawks. Analysis: Brown was inefficient with his opportunities for the second consecutive contest, and he's now totaled just three receptions on 10 targets over that stretch. The speedster is always a threat to break off a long reception, but with the inaccurate Drew Stanton behind center, he's likely to remain a hit-or-miss fantasy option each week. He'll look to up his catch totals versus the Texans on the road in Week 11. Brown brought in one of four targets for 52 yards in Sunday's 20-10 win over the 49ers. Analysis: Brown hauled in a 52-yard throw from Drew Stanton in the first quarter, but that ultimately proved to be the extent of his production. The 27-year-old has logged just one reception in each of his last two games, so his numbers continue to fluctuate significantly from game to game. Brown's health has at least held up in recent weeks, but he figures to continue serving as a hit-or-miss option in both season-long and daily formats, especially with Drew Stanton behind center.